hairulovchessmaniac: SEA Games Selection - Round 6 and 7 results and game! SEA Games Selection - Round 6 and 7 results and game! After two week break ( to give way for Selangor Open) , The SEA Games Selection continued with two rounds ( round 6 and 7 ) held today. Round 6 of the men section is definitely the highlight of the day. The pairing saw the seniors meet the juniors. ...and 'the results' is the seniors win with the score 4-1. 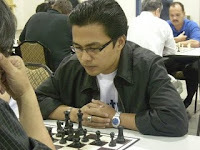 Only Sumant held the junior flag when he unexpectedly 'slay' the Mokdern Defense against Malaysian no.2 - IM Mok Tze Meng. Probably Mok had to reconsider his black's opening reply against white 1.e4 since he has lost two game in this tournament against Fong Yit Ho and Sumant with the Mokdern ( 1.e4 g6). In the women section, two upset was produced . First by Camilia ' the die hard Beiber fan' who beat WCM Nur Nabila Azman while another upset is created by Puteri Rifqah Azhar who beat the higly experience NWM and Malaysian no.1 women player - Nurul Huda Wahiduddin. In round 7, the clash between Malaysian no.1- IM Mashafizul and former no.1- IM Jimmy Liew, saw the status quo win ( Mas win). Mok who was beaten by Sumant in the previous round choose to split point with the last seed - Tan Jun Feng. Puteri Munajjah Azhar who was born in the 21st century and in the 3rd Millenium beat the higly experience NWM and Malaysian no.1 women player - Nurul Huda Wahiduddin who was born in the 20th century and in the 2nd Millenium. In the previous round, Nurul was beaten by Munajjah's older sister - Rifqah. With two more rounds to play, Malaysian no.1 - IM Mashafizul who is still unbeaten, lead the pack with 6 points followed by IM Jimmy Liew with 5 points. Except Sumant who is in 4th place, the other junior players fill the 7th-10th place. Except IM Mok Tze Meng who is in 6th place, the seniors seems to dominate the top places . Surprisingly the first seed - NWM Nurul Huda Wahiduddin is in the last place. She was clearly a little bit rusty against the more active juniors players. Nurul has seldom play in local and international tournament lately and she probably found that experienced didn't help much against the juniors.